If you have a cabin or cottage on a fishing lake or river, you may want to carry the fisherman theme into the decor of your retreat. 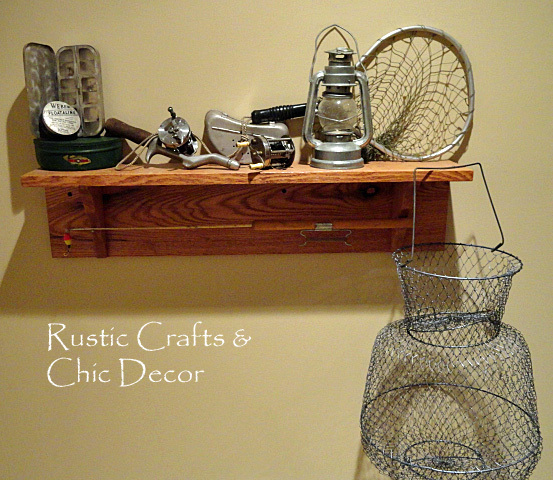 Maybe you just love fishing and want to dedicate a spot in your home for some rustic or vintage fishing decor. Either way, I have some fun ideas for you that I have used in my own home and cabin. Most all of my decorating accessories come by the way of vintage treasures. 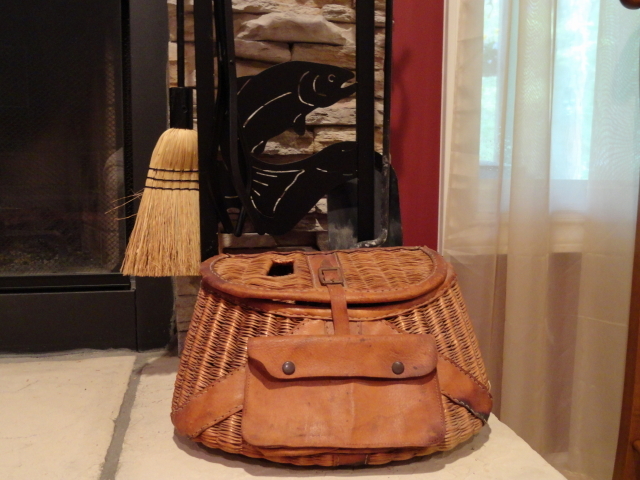 My husband and I love to shop flea markets and antique stores and have collected several old fishing items. 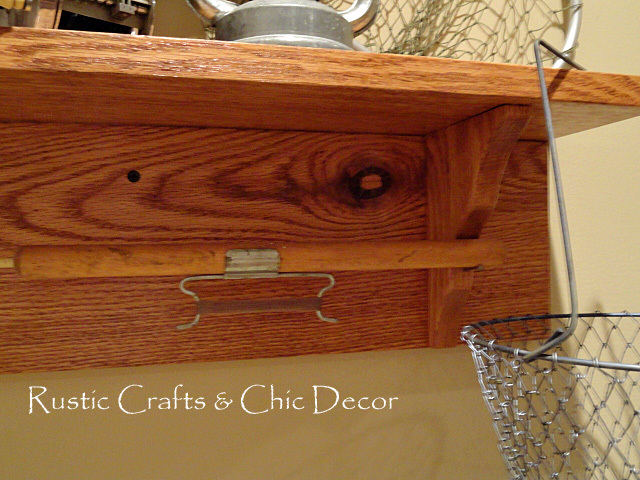 However, we also have some fishing decor that is just plain rustic. 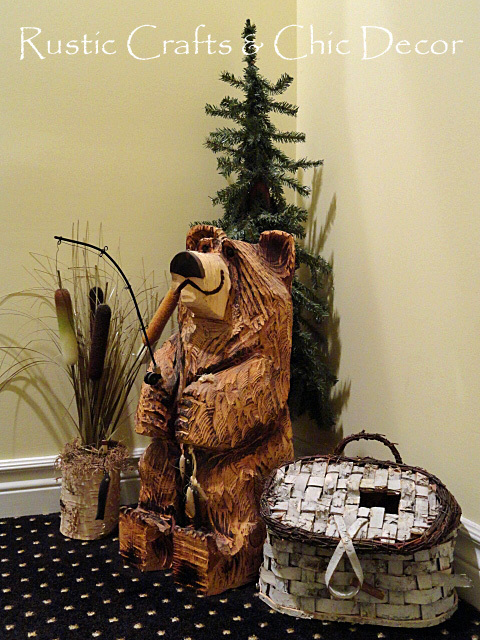 Before I show you some of our collection, I have to tell you about this fishing bear here! It would probably be a great accessory to have sitting outside, especially at our cabin, but I wanted to make a fun display on our stair landing. This is on the stairs leading to our basement, which is decorated very rustic, and I wanted to start setting the tone on the walk down. I made the cat-tail display by inserting cat-tails into a section of birch log that had a large hole drilled out at the top. My husband drilled the hole easily with a drill press. I bought the little pine tree after Christmas one year on clearance. It works quite well for a year round decoration in this setting! 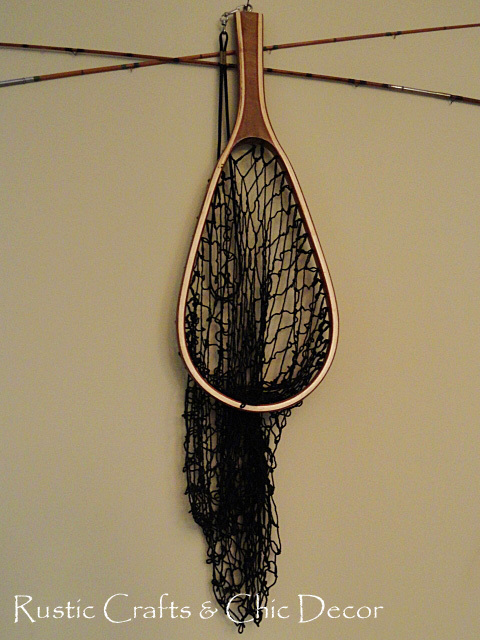 We continued the fishing theme in a couple of different areas in our basement. The first spot was one dedicated wall in our game room. 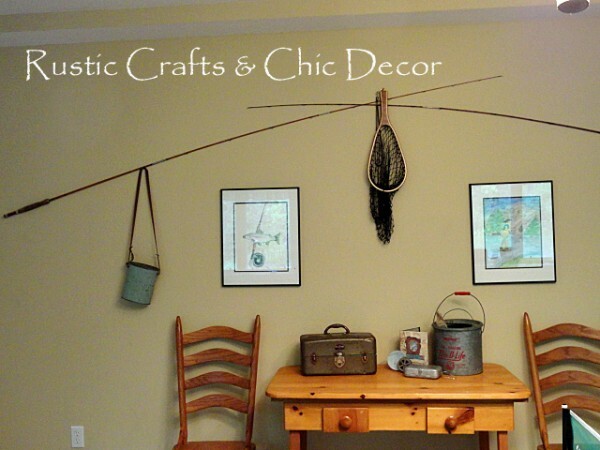 Wall dedicated to vintage fishing accessories. This is one big wall so we had plenty of room to fill up! We started by criss-crossing two old fly rods, which helped to take up a lot of the space. Then we hung a couple of fishing pictures and draped some fishing accessories at points along the rods. Vintage fishing net between poles. The center point was a good place to hang this fishing net to kind of anchor the rods in place. 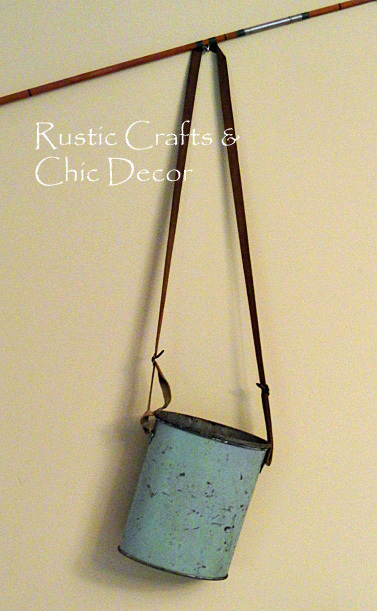 This cool vintage minnow bucket was just recently acquired and found a place at the end of our rod display. 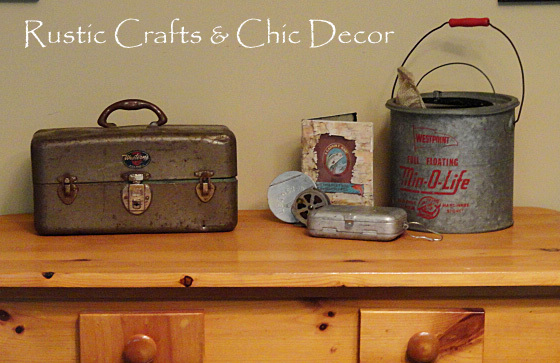 We also used this table in front of the wall to display a few more of our vintage finds. 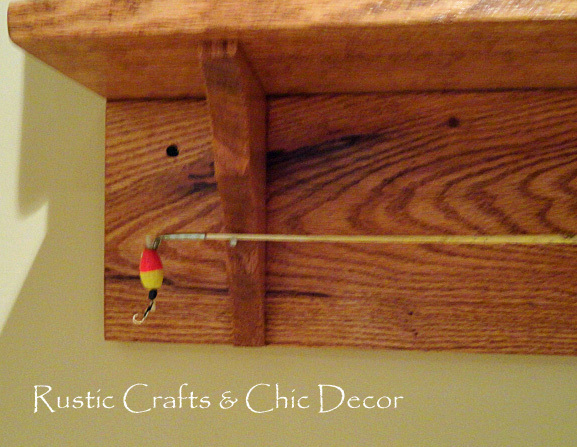 Table top vintage and antique fishing accessories. 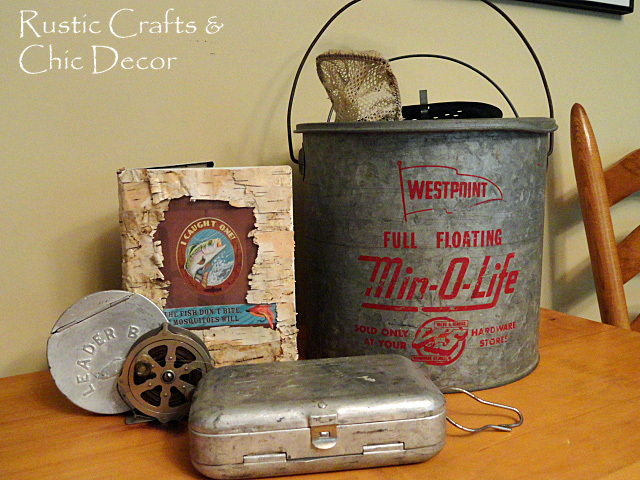 Vintage minnow bucket, fly box, leader box and fishing reel. 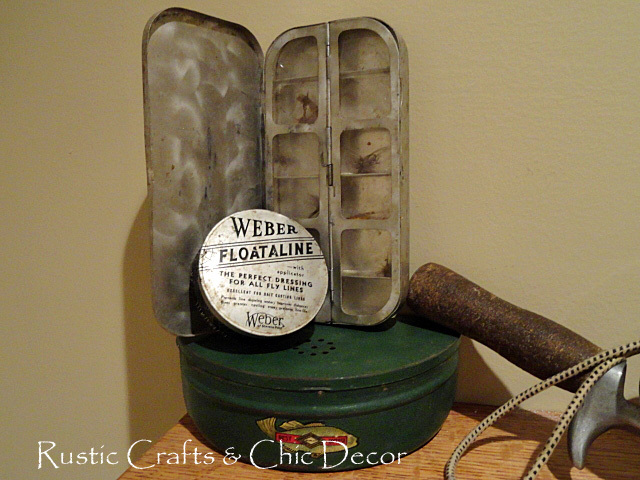 Besides the large tackle box, this more common minnow bucket, leader box, fishing reel and small tackle box make up the rest of our vintage items on display. I also had to add in the fly box that I made from a recycled dvd! Shelf filled with antique fishing collectibles. Close up vintage fishing accessories. 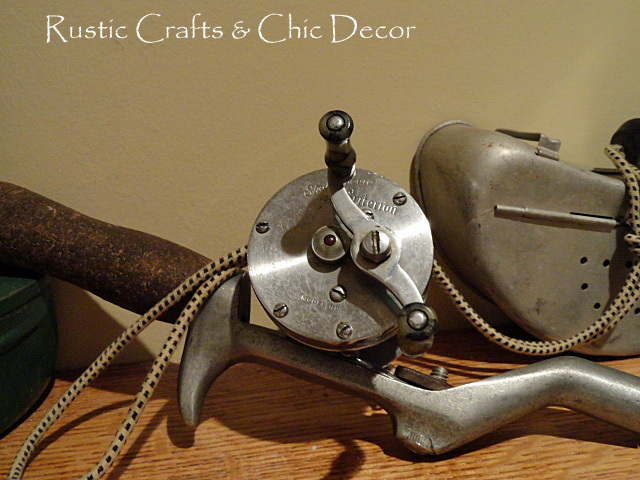 Close up vintage fishing reel. 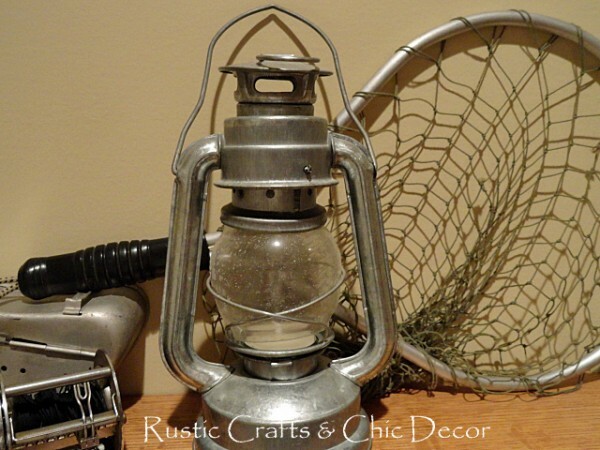 Old lantern and fishing net. Old fishing pole end and bobber. Finally, we also carried a little bit of the fishing motif to our fireplace hearth. Close up of vintage fishing creel. 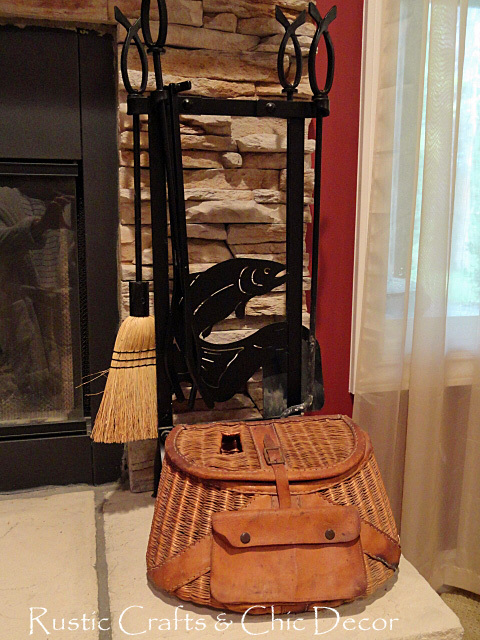 We placed one of our vintage creel’s here as a nice base for the fishing inspired fireplace tools. My husband’s father owned a bait and tackle store before he passed away,and he had an old minnow bucket just like the one in the picture and tackle box. I’m going to set him up a display as a surprise. Thanks for the great pictures.